You can follow along with Nick on his journey again this winter as he goes out to concur Snowball Cancer Challenge 2011. Nick has set his personal goal for this year at more than 20,494 + miles (Also, to raise more than $100,000). This would give Nick a grand total of 40,000 + miles in 120 days! View Nick’s Maintenance Log By Clicking…..SCC2011_Maintenance Log. ♦ Travel: Richmond-MN, Farming, Freeport, Albany, Sioux trail up to Moose Lake, 5 miles past Denham, turned around and headed back to Richmond-MN. ♦ Notes: I started the day knowing that it was going to be a very meaningful day to me…..I celebrated what I call as my 10th Birthday since I had pancreatitis (I pounded on the big pearly doors that day 10 years ago and he wouldn’t let me in. He had a bigger purpose yet for me to do in life) and it was also officially Nick Keller Day in Richmond that honored my finishing of my run last year on this day. However shortly after waking up in the morning, I received the news that my dear friend Claudia had passed away only a few short hours into today. So today became even more meaningful to me. I would now ride in honor and dedication to my dear friend Claudia who passed away from a long battle with cancer. I love you and will miss you so much! You will forever be in my heart. The short time that I have known her; I have a lifetime of memories of her that I will carry with me forever. She was my rock last year and so I tried to return the favor to her this year when she needed me. I thought of her all day and had tears in my eyes as I was sledding down the trails. However when SledHead 24/7 welcomed me and asking “what kept you going?”…..I just couldn’t hold back my emotions and how deeply sad I was. But I want to thank everyone from the bottom of my heart for all of your great support that you have given to me and the foundation. Also, thank you to Todd and Wayne; along with Steve and TJ for riding along with me on the trails today. I really was in the need of great support on my final miles. A big THANK YOU to Wayne & Christine DeHoux for buying a tank of gas and for my final two tanks I personally bought them in honor of my six grandchildren that I love and missed so much (Zachary, Olivia, Tyler, Sean, Alex, & Nicole). I will write my additional thoughts and feelings hopefully sometime next week. So please do come back and continue your great support for the foundation. I must take a few days to pay my respects to my dear friend and her family that I have grown so close to in such a short amount of time. Until then THANK YOU! ♦ Travel: Moose Lake-MN, down the sioux trails about 100 miles to Bowlus-MN, turned around and headed back up to Denham, turned around and headed back down again, Albany, Farming, Richmond, Roscoe, and finally back to Richmond-MN. ♦ Notes: Todd told me that there was snow in MN and it only took me about 5 seconds to decide to trailer up and head for the snow. So I greased the sled up in Ironwood and then we trailered back over to MN and I started sledding around 12:09 pm. I rode for about 9.5 hours today and enjoyed all of the snow on the trails. Much, much better than what I had been dealing with over the past days. 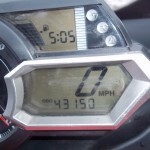 When I was riding in the vehicle it kept feeling like Todd was driving so slow….but I kept looking over at the odometer and realized we were moving….I am just not used to the vehicle speeds since it has been quite a while since I have ridden in one. It was great meeting up with Julia Dunphy at the Isle gas station. Also for meeting Larry Sumner who brought his son into the store to shake my hand. He told his son, “Here is a man doing something for a cause”. It was really nice to meet you (also take pictures) and that you support the cause (even if you are an Artic Cat man). 🙂 A big THANK YOU to Marcy from the Hurley Citgo for buying a tank of gas yesterday (I forgot to mention); also she bought another tank of gas today; Tom Schlangen for a tank; and Henry & Cheryl Schlangen for buying a tank of gas as well. Thank you again to everyone who has helped support Snowball Cancer Challenge 2011. Well I think that I am going to finish up my paperwork and head to bed so that I can have plenty of sleep to prepare myself for my last and final day of my Challenge. Anyone is more than welcome to join me on my final day of the journey or if you would like to come and join me for dinner at Grandpa Jerry’s up town in Richmond around 5pm. ♦ Travel: Ironwood-MI, Trail 2 to Wakefield, Trail 8 to Lake Gogebic, Trail 102 and 11, then Trail 1 to White Pine, lapped these 2 routes all day for miles, then back to Trail 8 to Wakefield, Trail 2 to Ironwood. ♦ Notes: Before heading out, my wife Janet and I put new high-fax (slides) and greased the sled. Then I did a few radio interviews and made a few phone calls before heading out. Mary Jane was bucking a little bit at first but she adjusted quickly to her new slides. We even stopped at the scene where she stubbed her foot last night. It had a lot of rocks on it. The trails have no snow so I am riding a lot of tar roads and dirt. However the minor scratches that the sled has gotten over the past weeks is nothing compared to everything that people with cancer go through each day. Otherwise there was not many people out on the trails again today. However after a local lady was taking a picture of my sled, a group of guys was asking what was so special about that sled…..she told them how many miles I had on it….then they said it looks like their next sleds they buy will be Yamaha. 🙂 So here we are with only 1 more day of riding up in the U.P. for Snowball Cancer Challenge 2011; as tomorrow after I ride I will be putting her on a trailer and heading back to Minnesota. I plan on riding my 60th and final day in MN (taking off from my home in Richmond on Wednesday around 9:30 am). So for anyone who would like to join -please come with. Well, I am going to try and get some more sleep tonight since I am pretty tired. Good night. ♦ Travel: Ironwood-MI, Trail 2 to Wakefield, Trail 8 to Lake Gogebic, Trail 102 to 11, lapped these 2 trails all day for miles, then back to Trail 8 to Wakefield, Trail 2 to Ironwood. ♦ Notes: It was very windy and very little snow; only a little bit of flurries in the air. The trails are very icy with lots of rocks and I only saw about 5 people all day out riding. Mary Jane even tipped slightly over on her side as I was on my way back to the house at night because of all of the ice out there. Thankfully nothing major – just flipped her back down and away we went again. She got a minor scratch but most importantly I am fine. Otherwise, I am just getting worn down with the lack of snow. I hear that my daughter got a foot of snow today; I really wish that snow could head up this way. Well, I am going to head out and change the oil on the sled before heading to bed for the night. ♦ Travel: Ironwood-MI, Trail 2 to Wakefield, Trail 8 to Bergland, Trail 1 to White Pine, Trail 12 to 101, back to Trail 13, Rockland, Greenland, Twin Lakes, Trail 3 to South Range, came back down to Mass City, back up to Twin Lakes, Trail 13 South to Greenland, Rockland, Bergland, Trail 8 to Wakefield, Trail 2 to Ironwood. ♦ Notes: Being that Jack wasn’t coming back up to clean my sled; my wife Janet was so nice to clean it up for me in the morning before heading out for the day. It looked much better after riding through all of the water holes yesterday. So yesterday I lost a little rubber cap on the trails and magically I found it today at a stop sign. I am always looking at the trails and checking out what is laying around. You never know what you are going to find. I was enjoying myself as I was able to talk to so many people on the trails. I even stopped to take pictures of these two little boys that were riding their kiddie cats with their fishing gear on the back for a fishing contest. They were so cute. 🙂 I also ran into Scott and Amy Martin from Gillman, MN (Benton County) that I met yesterday. They were able to ride about 20 miles with me from Bergland to Wakefield. Hopefully, I will get to ride with you another time. Also when I ate up at Krupp’s, I had a guy ask me how many years did it take you to put on all of those miles? …. I told him not years, days! Now that is what I call quality! It was also a great day since I officially achieved my goal of riding 40,000 miles within my two cancer runs; and at 5:00pm tonight I surpassed it. So currently I am averaging out 368.57 miles per day and still have 4 days to go. As the trails were very rough and lots of rocks; I am really praying for snow. So that is what I will be dreaming about tonight. SNOW! Lastly, I will be checking out my high-fax in the morning since they have about 5,000 miles on them and changing out my wear rods. ♦ Travel: Ironwood-MI, Trail 2 to Wakefield, Marenisco, Trail 1 to Lake Gogebic, up Lake Gogebic, Trail 102 and Trail 11 (South Boundary Road back and forth), Trail 8 to Wakefield, lastly Trail 2 to Ironwood. ♦ Notes: I woke up this morning hoping for snow, unfortunately I was disappointed. I changed my high-fax before heading out for the day. So a way Paul, Scott, and I headed out for our ride with very little snow. The groomers are doing the best they can with the minimal snow on the trails. A big THANK YOU to Marcy from the Hurley Citgo for buying my 1st tank (also for a tank from yesterday that I forgot to mention) and Dan Froelich from Forest, Illinois for buying my last 2 tanks of gas for the day. It was also nice to have run into some people from the Benton County snowmobile club at the Hoop N Hollar. It was great visiting and meeting you. Otherwise, sledding across the lake was horrible. It was just so windy that it blew the sleds sideways on the shiny ice on the lake. I even went on Mary Jane’s side once since it was so slippery. Thank you Scott for pulling me back down so we could keep on riding. Otherwise, I am just really hoping that we get some more snow with this new weather coming into town. ♦ Travel: Ironwood-MI, Trail 2 to Wakefield, Trail 8 to Bergland, Trail 13 to Rockland, Trail 3 to Hancock, Trail 17 to Calumet, Trail 3 to Coppor Harbor, Brockway Mountain, Trail 134 out to the point, turned around on Trail 134, Trail 3 to Calumet, Trail 17 to Hancock, Trail 3 to Rockland, Trail 13 to Bergland, Trail 8 to Wakefield, lastly Trail 2 to Ironwood. ♦ Notes: Today I was on a very specific mission to achieve 20,000 miles by the end of day 54. At the end of last year people would always ask me what I would have done differently….I always said to ride harder and longer. I believe that I did that today. It was a very fitting day to finish exactly with 20,000 miles in honor of Edgar Hetteen (an inventor and ‘godfather’ of snowmobiling) who passed away earlier this week. Thank you to Gary Koska who bought the gas for the day in honor of his friend. I bet he was smiling down on me and enjoying how far snowmobiles have come through the years. He was a great man who did so much for the sport of snowmobiling and his impact is still felt in the sport today; and for that I thank him. Lastly, I got the chance to speak with Pat and Kip from Pat’s Yamaha when I passed through Greenland; I also got to wave at Chad as I passed M&M Powersports in Hancock as well. They are such a great family and I am so glad that I got the chance to get to know them over the past 14 months. I was also reflecting on my mother’s passing and remembering how I was only 35 years old when she died. I was remembering how tough it was and knowing that life has to go on. You just have to work through the pain and keep moving. It will eventually get better. I know that my mother watches over me and she will always be by my side. ♦ Travel: Ironwood-MI, Trail 2 to Wakefield, Trail 8 to Bergland, Trail 13 to Rockland, Trail 3 to Hancock, Trail 17 to Calumet, Trail 3 to Coppor Harbor, Brockway Mountain, Trail 134 out to the point, circled around on Trail 135, back to Trail 134, Trail 3 to Calumet, Trail 17 to Hancock, Trail 3 to Rockland, Trail 13 to Bergland, Trail 8 to Wakefield, lastly Trail 2 to Ironwood. ♦ Notes: The heat was really melting the snow fast and I rode through many water holes on the trails. Jack spent so much time last night cleaning the sled and then it only stayed clean for about 1 hour today. Sorry Jack. I was stopped by many people on the trails and gas stops today it was overwhelming at all of the support. Mary Jane is a good ambassador for snowmobiling and represents a great cause to help people. People were waving me down on the trails and circling outside around the sled at gas stops; we even had to have a cop give us paper and a pen to write down names of people that were also donating money. Everyone seemed to know someone with cancer and had stories to tell. It was great getting to talk with everyone and let them enjoy the sled just like I get to each day. I even had one guy get on the ground with my flashlight to check out my high-fax. He was just amazed at how well they hold up and how great this sled runs. 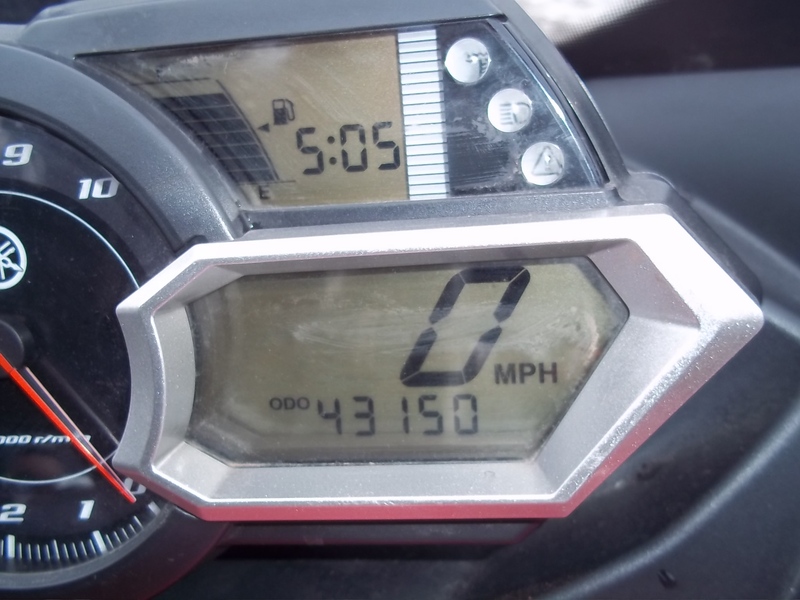 People wanted to take pictures of the odometer as well to prove that they saw a sled with that many miles on it. Some of them were very excited to finally see me since they had been following my blog since last year and was hoping to one day run into me. So thank you for all of your great support. Also a big THANK YOU to Marcy at the Hurley Citgo for buying 1 tank; Krupp’s Mini Mart for buying 1 tank; Richard Lucas from Texas for buying 1 tank; and George Hemmesch for buying 2 tanks of gas today as well. Other than that….I am looking forward to next week at this time when I will get the chance to sit on the couch and just relax for a couple of days. I am finally only 900 miles away from my goal that I set out for at the beginning of the season. I just hope for more snow to come. Well, I better get a load of laundry and paperwork done so that I can get some sleep. ♦ Travel: Ironwood-MI, Trail 2 to Wakefield, Trail 11 North to 102, Lake Gogebic(40 miles on lake), Trail 102 North to 1, White Pine, Trail 12 to 101, Trail 13 to Greenland, Trail 13 North andturned around, Greenland, Trail 13 to Bergland, Lake Gogebic (100 miles on lake), Trail 8 to Wakefield, finally Trail 2 to Ironwood. ♦ Notes: The crew all survived yesterdays long ride. I had Tony, Ron, Jack, & Mike join me for my ride today. It was really enjoyable and we even dressed Tony in Yamaha clothing since he was riding my ’08 Vector again today. If he was going to ride the sled then he had to dress the part as well. A big THANK YOU goes out to Jack & Cathy Stang for buying a tank; Paynesville Auto Value for buying a tank; Pat’s Yamaha in Greenland for buying a tank; and George Hemmesch (happy birthday) for buying a tank of gas today. It was great getting to call Wade at the Yamaha headquarters in WI and letting them know that my sled would be turning past 40,000 miles sometime during the day. I got the great opportunity at 4:21pm to celebrate this achievement by taking a picture with both Ron from A&C Yamaha from Paynesville, MN and Kip from Pat’s Yamaha from Greenland, MI while outside in Greenland today. There was even about 8 other people snapping pictures outside when we were. It is GREAT that I have gone 40,182 miles on this sled in only 122 days of riding total. It just simply amazes me everyday. I was even thinking how my daughter’s vehicle that is 5 years old doesn’t even have that many miles on it. What can one say – but simply amazing! Otherwise, I was able to stop in at the Hoop N Hollar and talk with people as well. Lots of questions about the kind of oil I use or what grease I put on the sled, and of course how many miles I have or how many more to go. As the crew headed back to the house instead of running another 100 miles on Lake Gogebic tonight; I was not alone. I kept looking up at the sky – Cole is out with me! The moon was just so big and bright up in the sky. So as Cole kept me company; I just kept running numbers in my head trying to calculate how many more miles to go in only 8 days. Well since I have ridden 1838 miles (459.5 average) in only 4 short days; I am going to try and get some sleep. Good night. ♦ Travel: Ironwood-MI, Trail 2 to Wakefield, Marenisco, Watersmeet, Iron River, turned around all the way back up to Wakefield, Trail 8 to Bergland, Lake Gogebic, Trail 13 to Rockland, Trail 3 to Twin Lakes, Hancock, Trail 17 to Calumet, Trail 3 to Coppor Harbor, Trail 134 out to the point, Trail 134 to 3, Trail 3 to Houghton, Rockland, Trail 13 to Bergland, Trail 8 to Wakefield, Trail 2 to Ironwood. ♦ Notes: Got up bright and early for my Valentine’s Day Challenge Run! Mary Jane and are running at 110% and doing awesome. THANK YOU to Pat & Nancy Linn for buying 2 tanks; Jack & Cathy Stang for buying a tank; and A&C Farm Service and Yamaha from Paynesville-MN for buying my last 2 tanks of gas for the day! Thank you all for your great support and contribution. Everyone did great today and hung in there. We got many thumbs up and people pointing their fingers along the way. I got to meet and talk witha lot of great people on the trails and at the rest stops today even though we had a mission to put on all of the miles. I even got the chance to meet Dan F, his daughter Elizabeth, and Matt W. who were from Forest, Illinois. I met them up at M&M Powersportsin Hancock. Elizabeth is a radiation therapist who works with cancer patients each day. It was great talking with you and taking pictures. Tony had fun using my ’08 Vector. Jean the dots were further apart since I was trying to catch up to Tony. He was driving the sled so fast like he stole it and didn’t have a dime in it. He really liked the Yamaha. We even got split up for a little while between Hancock and Copper Harbor since the kids were all having so much fun. It was ok though since there is only one way out so we met all back up at Chad’s place. They were all like school kids enjoying playing in the snow. It was really enjoyable watching them all day. 🙂 Mike and I were keeping an eye on how everyone’s backs were holding up….We told Nancy what to do to make it feel better and she said it is not happening. Otherwise, Ron said his new therapy is to come to Michigan more often and snowmobile. And Cathy, you can rest easy knowing that your sled was not abused that much. Well, I better get some sleep for tonight since tomorrow will also be a great enjoyable day hitting a great milestone…..40,000 miles on the odometer. Also, we will see how many fellow riders will be able to actually get up and sled tomorrow. They all gestured that they would see how they feel. ♦ Travel: Ironwood-MI, Trail 2 to Wakefield, Trail 8 to Bergland, Wakefield, Trail 2 to Iron River, Florence-WI, Trail 113 to Crystal Falls, Trail 111 to Amasa, Trail 15 to Sidnaw, Trail 8/15 to 109 to 12, Mass City, Trail 13 to Bergland, Lake Gogebic about 45 miles, Trail 8 to Wakefield, Trail 2 to Ironwood. ♦ Notes: Today was windy and warm outside. I was a little over dressed but decided to keep all of the clothing on to stay warm as the sun went down. A big THANK YOU to Brian & Margie Willemsen for buying 3 tanks of gas today! Also it was great getting donations from random people out on the trails and at the rest stops as well. Lots of people that I meet each day tell me that I am doing it for all of the right reasons and for a great cause. Also it was great getting to stop and talk with Merie, Rachel’s mom up at Mass City. Well, all of the remaining crew showed up around 7pm tonight to join me on our 500+ Mile Pledge Valentine’s Day Challenge tomorrow (the following people will be riding: Brian, Nancy, Tony, Ron, Jack, Mike, & myself). It was great getting their help changing my oil, flushing out the chain case oil, and getting the sled a total grease job. Well, I am going to eat some dinner and get to bed for our long ride tomorrow. Thank you everyone for your continued support during Snowball Cancer Challenge 2011. ♦ Travel: Ironwood-MI, Trail 2 to Wakefield, Trail 8 to Bergland, Trail 102 to 11, Silver City, Trail 1 to White Pine, Trail 12 to Ontonagon, Greenland, Trail 13 to Twin Lakes, Trail 3 to Rockland, Bruce Crossing, Trail 8 to Kenton, Trail 107 to Watersmeet, Trail 2 to 13, Trail 100 to bottom of Lake Gogebic, 145 miles on Lake Gogebic, Trail 8 to Wakefield, Trail 2 to Ironwood. ♦ Notes: After inspecting the sled last night, I found a cracked Y-exhaust pipe and 1 of the flex pipes was broken. So I replaced all 3 flex pipes and fixed the exhaust (after a mere 38,000 miles on them). So she was nice and quiet today. Then in the morning, my great neighbors Pat, Steph, and Jesse came over and helped me put the suspension back into the sled before they headed out for ice fishing. Thank you so much for your help! Also, THANK YOU to Brian & Margie Willemsen for buying 2 tanks of gas. After so many days of sub zero temps it was nice for the heat wave today. I had a great time stopping in at Twin Lakes for their snowmobile club’s open house (I ate a hot dog lunch). Also, I met great people at the Hoop N Hollar as well as other stops along the way. I even met a group of people from Brainerd andRichmond, MN as well. Otherwise, I had a great day putting on all of my miles. I had to make sure that when the fresh meat come up for our 500+ mile pledge day (taking place on Valentine’s Day) that I would be capable of doing it. So I had decided to pretest myself to make sure I am in shape even though I had less than 6 hours of sleep. Well, I am going to try and catch up on some sleep tonight. ♦ Travel: Ironwood-MI, Trail 2 to Bessemer, Trail 11 North to Silver City, Trail 1 South to Bergland, Trail 8 to Bruce Crossing, Trail 3 to Rockland, Trail 13 to Greenland, Trail 12/109 to Rousseau, Sidnaw, Trail 8 to Bergland, Lake Gogebic, Trail 1 North to White Pine, back down to Trail 8, Wakefield, finished in Ironwood. ♦ Notes: Well, I had a good night sleep after sitting in the hot tub and watching a little bit of a movie last night before bed. Then Wayne, Terry, and Todd all headed back down to MN in the morning. THANK YOU to Marcy at the Hurley Citgofor buying a tank of gas for me this morning. I was able to make it up to Pat’s Yamaha in Greenland this afternoon. I got to talk with Pat when they changed out the throttle sensor block on the handle bar after being squeezed for more than 38,000 miles. It was just a little wore out from going in and out for so many miles. I was waved down by a group from Rochester, MN that told me ‘your our hero’. They really respected what I am doing and why I am doing this ride. I felt very honored that they would tell me that. Then I met another group on the trails from Illinois that asked me ‘you are the man in the posters?’, I told them yup. Otherwise, I think I have finalized my route for Monday’s 500+ mile challenge ride in honor of my mother and all others who have passed away from cancer. So I decided to come in early and do some general maintenance on the sled to keep it in tip top shape for all the miles coming next week. ♦ Travel: Ironwood-MI, Trail 2 to Wakefield, Trail 8 to Bergland, Bruce Crossing, Trail 3 to Greenland, Twin Lakes, Houghton, Hancock, Trail 17 to Calumet, Trail 3 to Copper Harbor, Trail 134 loop to Point, Trail 134 back down to 3, Calumet, Trail 17 to Hancock, Trail 3 to Mass City, Rockland, Trail 13 to Bergland, Trail 8 to Wakefield, Trail 2 to Ironwood. ♦ Notes: Got up early to finish up my paperwork this morning. A big THANK YOU to Ann Lucas (from Texas) for buying my 1st tank and to Krupp’s Mini Mart in Twin Lakes for buying my 2nd tank of gas today. It was a very nice clear day but just very cold. I enjoyed watching Wayne ride my 2008 Yamaha Vector snowmobile hard for the last two days. I am sure his wife Christine is relaxing knowing that he isn’t riding her sled that way. 🙂 I also called and wished my daughter, Carrie in Australia a HAPPY BIRTHDAY today! Sorry that I called past midnight your time. I got the chance to stop and speak with Chad in Hancock atM&M Powersports about his mom, Claudia. I was also able to speak with Mari in Mass City about Rachel as well. We all had great conversations andit makes up closer. Lastly, I am going to start planning the final routes this weekend for the 500+ mile challenge run on Valentine’s Day. ♦ Travel: Ironwood-MI, Trail 2 to Wakefield, back to Ironwood, Trail 2 to Wakefield, Trail 8 to Bergland, Trail 102 North to Silver City, Trail 1 to White Pine, Trail 12 to Ontonagon, Trail 13 to Twin Lakes, Trail 3 to Rockland, Bruce Crossing, Trail 8 to Bergland, Trail 2 to Wakefield, Ironwood, Trail 17 South approximately 40 miles andthen turned around and came back to Ironwood. ♦ Notes: Got up this morning and put new finger nails on Mary Jane (wear rods) and greased her a little bit. Wayne was mumbling about Christine’s sled this morning…something about duck tape. Not sure if he was going to tape his handto the throttle or to keep the tongue from hanging out from the long ride yesterday. So Wayne decided to ride my 2008 RS Vector GT for the day. After we headed out we turned around and came back to hook up the power cord on my other sled for his heated shield to work. Otherwise, his shield was frosting up. That was not so good. So a much better ride once we got that all hooked up for him. There were very few people out on the trails due to the high winds and blizzard like conditions out in the open. Otherwise, it was Wayne, Terry, and I out on the trails. THANK YOU to Marcy at the Hurley Citgofor buying a tank of gas this morning! Also, I was happy to make it back up to Greenland to visit at Pat’s Yamaha. Well, I am going to get some sleep since I am getting more tired as the days are building; I am currently 2,251 miles ahead of my last years pace. ♦ Travel: Richmond-MN, to Paynesville, Richmond, Farming, Albany, Sioux Line Trail north to Moose Lake, Candy Dancer Trail, Trail 2 East to Superior-WI, Ashland, Marengo, Mellon, Trail 77 to Iron Belt, Ironwood, Trail 17 South to Pine Lake, Trail 13B to 13, Trail 15 Southto Island Lake, Trail 15 North to 8 East, Trail 17 North back to Ironwood-MI. ♦ Notes: Got up and headed back to Paynesvilleto change out the water hose to connect heat exchanger. Thank you Ron for taking it off of your sled in the mean time since we didn’t want to risk anything with the other one that got a little damaged when the belt broke the other day (he took it from his since there was not one on handat the moment). I enjoyed my ride back up to Michigan with fellow riders: TJ M, Wayne D, and Terry V. TJ met me at the house already in the morning androde withallthe way to Superior, WI before turning around andheadingback down to Richmond. Thanks! Also, Todd and John drove the truck and trailer back up to Ironwood so that Wayne and Terry don’t have to sled back on Friday but rather catch a ride. Otherwise, it was great sledding back up to the U.P. The White Thunder Riders groomer made a nice bed for me to ride on. It was nice getting to stop along the trail and talk. Wayne and Terry got ahead of me prior to Ashland andtheygot about a mile into town before realizing that I was not behind them and they went to far. I simply waited at the ‘T’ that they were supposed to have taken a right at for about 5 minutes or so when they came back. The guy who knows the directions should not be in the back of the line. It was funny when someone stopped to check if I was lost when I was waiting; I just told them I was waiting for the other 2 that went to far and that they would eventually realize it andturn around. 🙂 And they did. As I was riding, I was also thinking about how my sledding is like my niece (Linda Keller) and her running. When you do long distance you need to keep a steady pace for yourself. Then at the end you break out and speed up. But ultimately, slow and steady wins the race. Well, I am going to get some sleep andhopefullyrack on the miles on my final 15 days that remain. My goal is to return back to Richmond-MN in two weeks and do some local riding for my final day. Then, I hope to eat a good meal up town and relax. ♦ Travel: Paynesville-MN, Roscoe, St.Martin, Farming, Albany, SaukCentre, Alexandria, Fergus Falls, turned around andbackdown to Albany, Farming, Richmond, Paynesville, Spicer, Willmar, turned aroundback home to Richmond. ♦ Notes: Got up early this morning and brought Mary Jane over to A&C Yamaha in Paynesville to get her new track put on. Since she was in the shop they changed the oil, chain case lube, andtotal grease job. Thank you A&C for all of your great help. Nancy Linn snowmobiled with today from Paynesville to Fergus Falls andback. She braved the very cold temps (more than -20 at times withthe wind blowing right at us). A big Thank You to Pat & Nancy Linn for buying a tank of gas today as well. My Klimsuit really shined with this weather. We didn’t even see anyone else out on the trails. I am not sure why when it was so beautiful outside. I wanted to say, Thanks to the Brandon rest stop for the great lunch. It was nice to sit and chit chat about the foundation andthe ride. The men drinking coffee thought I was a bit crazy for riding all of those miles. He said he would not put that many miles on even in his car withtheheater running. 🙂 Well, it was great to have a quick visit. I am planning on riding back up to Ironwood, MI tomorrow. If the snow stays good, I am planning on riding back down from Ironwood to Richmond on February 22nd andendingmy 60 day challenge in the local area of Richmond on the 23rd. I will keep you all posted! ♦ Notes: HAPPY BIRTHDAY to my grandson Alex who turns 8 years old today! Well, I am heading back home to Richmond, MN for an unplanned visit. When I did my morning inspection of the sled, I noticed that their were some broken track clips and decided to head home to get a new track put on at A&C Yamaha in Paynesville, MN. I also thought it would be nice to ride around the local trails andgetto see people that I have not seen in 43 days. So away I headed down for my 11 hour ride back to Richmond. I am going to get the new track put on Monday morning andthendo some riding; so anyone who wants to join just let me know. Otherwise, when I past Duluth on the trails I met a dog sledder doing a 30 mile training run today. He was so great to stop and let me take a picture of the dogs. So as I sat and looked at his dogs, he looked at my sled. Thanks for stopping for me. Then as I was on the trails, Scott Keho and Tanner Linn joined me near Isle. It was good since my belt just blew andhadto be changed on the trails. Thanks Scott for picking up all of the scrap shavings that were laying down on the ground andhelping with the change. He was trying to have Tanner buy a piece of history, but he was not biting on it. 🙂 Also a big THANK YOU to Scott & Nicole Kehofor buying a tank of gas today. Also, TJ Morton met up withus on the trail as well. It was great getting to ride with these 3 andfor them showing their support. Lastly, it was just so wonderful riding withthe high winds on the trails with it pushing against my Klim Yamaha suit. I always feel the pressure but never the cold. It makes for a much more enjoyable ride. The best suit that I have owned. Well, I am going to get some sleep for the first time in 43 nights in my own bed. ♦ Travel: Ironwood-MI, Trail 2 to Wakefield, Trail 8 to Bergland, Trail 102 North to 11, Silver City, Trail 1 to White Pine, Trail 12 to Ontonagon, Greenland, Trail 3 to Houghton, Dollar Bay, Calumet, Trail 17 to Hancock, Trail 3 to Twin Lakes, Trail 13 to Greenland, Rockland, Trail 3 to Bruce Crossing, Trail 8 to Bergland, Trail 2 to Wakefield, back to Ironwood. ♦ Notes: I want to start off by wishing my grandson Sean a HAPPY 8thBIRTHDAY over in Australia. (Well he actually celebrated yesterday since they are 17 hours ahead of us.) I headed out riding on my own today with a light misty rain for most of the day. I did my riding in memory of Donald Lemke who lost his battle to cancer earlier this week. I wanted to bring him out to the outdoors andgivehim a scenic ride that was just so beautiful. He will truly be missed by all. On my ride today I also headed back up to Greenland to see if I could visit Claudia. Pat just smiled when I got there and told me to go up to the house to see her since she was sitting up today. I went into the house and knelt down in front of her and she just smiled back at me. I was so happy that she and I got the chance to talk and visit for awhile. She means so much to me. She was there to help me through my darkest days last year and now I want to be here for her. It is so amazing how two people can become such great friends in such a short amount of time. Well when I was on my way back to Ironwood, I met a guy at a gas station and was telling him how a guy misses out on so much when he leaves his home for 60 days. But he told me that I am doing it for all of the right reasons. I also met some people from Annandale, MN that wanted to know how many miles I have gotten on the sled and how many miles I am averaging at the moment. When I told them I am averaging 360 miles per day, they told me ‘you make us look like a bunch of wimps – we better get going and get some miles on’. That was pretty funny and put a smile on my face. ♦ Travel: Ironwood-MI, Trail 2 to Wakefield, Trail 8 to Bergland, Trail 13 to Greenland, Trail 3 to Bill Nicholls Trail to Twin Lakes, Trail 13 Southback to Greenland, Trail 12 to Rousseau, Sidnaw, Trail 8 to Kenton, Trail 107 to 2, Watersmeet, Trail 2 to Ironwood, Trail 17 South to Manitowish, turned around and headed back up to Ironwood. ♦ Notes: It was windy and snowing a little bit through out the day. A big THANK YOU to Marcy at the Hurley Citgo for buying my 1st tank; Charles & Lynn Reichert for buying my 2nd tank; and Jim Seaquest for buying my 3rd tank of gas for the day. I had people catch me at all of the rest stops asking questions about the sled and definitely needed to know how many miles I was at so far. I really enjoy that people are watching what I am doing andlike the updates. I also got the chance to speak with a really nice lady, Lisa. She was telling me all about when she had cancer 15 years ago and how they had to get rid of it. I really appreciate hearing peoples stories and definitely good survivor stories as well help. I truly remember everyone’s stories that I am told andcarry them with me as I ride for a cause. Well, I am going to cut things short for tonight since I have to head out and do maintenance on Mary Jane. I will update more tomorrow on what I all end up doing. ♦ Travel: Ironwood-MI, Trail 2 to Marenisco, Bottom of Lake Gogebic, Trail 13 to 8, Bruce Crossing, Trail 3 to Rockland, Trail 13 to Greenland, 40 Mile Loop up to Twin Lakes, Trail 3 to SouthRange, Trail 120 to 121, Trail 3 to Twin Lakes, Trail 13 Greenland, Rockland, Bergland, Trail 8 to 2 to Ironwood, then finished up with Trial 17 Southforabout 20 miles then turned around, back to Ironwood. ♦ Notes: Well I finally got 8 hours of sleep last night. That was my first good sleep in at least 2 weeks. Before heading out, I had to do major greasing on the sled. Doc scrubbed the clutch ; he didn’t use his dental tools though. A big THANK YOU to Marcy for buying my first tank; Jim Seaquestfor the second tank; and Thomas & Jane Widmer for buying tank 3 and4 for the day. Today ended up being a very emotional day for me. I had a couple of highs; one which included seeing so many people standing aroundmysled in Greenland (I had to take a picture). I came over by them and was asked a ton of questions. They asked about the clothing, the sled, how she is running, and the foundation. It was wonderful seeing so many people supporting me. Then, for the emotional low was about Claudia. It is just so amazing how people in the U.P. treat you like family. I was very humbled how Claudia’s family has truly brought me into their very personal family situation andinviting me to be with them as Claudia will be home from the hospital tomorrow. I had a lump in my throat andtears in my eyes as I spoke withher husbandthis afternoon. They have become like family to me. I am hoping to spenda bit of time with Claudia on Saturday. That will be a very emotional day for me. After I left there, I didn’t even know where I was at for the first 6 miles; I was just so deep in thought. Well, I am emotionally drained for the day and need to get some rest. I have a feeling the next couple of days will be very long andneed to keep up with the rest. Good night. ♦ Travel: Ironwood-MI, Trail 2 to 8, Bergland, Bruce Crossing, Kenton, Sidnaw, Baraga, Champion, Trail 5 South to Republic, Trail 118 to Amasa, Trail 111 to Crystal Falls, Trail 113 to 2, Florence, Iron River, Watersmeet, Marenisco, Wakefield, and lastly Ironwood. ♦ Notes: I forgot to mention that I got a nice voicemail from my daughter’s father-in-law from Australia yesterday. That was really nice to hear from Winston and show his support. I appreciate all of the people who reach out and show their support of the foundation and everything that it stands for. Well, it was just Doc and I today on the trails. A big THANK YOU to Marcy at Hurley Citgo for buying my 1st tank; Jerrod/Sarah/Josh for buying my 2nd tank; and lastly to Thomas & Jane Widmerfor buying the 3rd tank of gas for the day. It was pretty interesting that I met a fellow ‘JohnDee’ friendon the trail by Bruce Crossing. He was on his way up to Copper Harbor using the trails that I told him to take from my Day: 32 run. Also Jim from St. Paul, MN has come back up to Ironwood to do more snowmobiling withme. That was great that he got to make it back out. He was really enjoyable being aroundwhen he was here last time. I wanted to also point out how wonderful it is when I am riding down the trails or at rest stops that I get people with their thumbs up or pointing to show their support. Lastly, I had to pat my mother’s rosary that I keep in my inside chest pocket that sits over my heart everyday. I had to say an extra prayer for a man that I have known for close to 40 years that lost his battle to cancer today. Donald Lemke will be truly missed; rest in peace. I thought about him and many others who have fought or are fighting so hard from cancer along my entire route today. ♦ Travel: Ironwood-MI, Trail 15 South to 13, over to Trail 9, Turle Flowage, Trail 10 to 17, back to Ironwood, then Trail 2 to 8, Bergland, Lake Gogebic, Trail 13 to Greenland, Twin Lakes, Trail 3 to Mass City, Trail 13 to Greenland, Rockland, Trail 4 to Bruce Crossing, Trail 8 to Bergland, Trail 102 to 11, Bessemer, Trail 2 to Ironwood, and finished up taking Trail 17 South for 15 miles and turned and back to Ironwood. ♦ Notes: I brought Nelle out for one last ride before she had to get heading home so I brought her down to Camp ‘1’ and dropped them off their Snowball Cancer Challenge T-shirts they bought. While there we were also discussing options for next years fundraiser. Then we got back andhada quick lunch before I headed out with Doc and then picked up Brian and Paul along the way. A big Thank You to Jerrod/Sarah/Josh for buying my first tank; Charles & Lynn Reichertforbuyingmy second tank; andPaul Larson for buying my third tank of gas for the day. I also did really good on my miles per gallon driving behindDocfor most of the day. He helped block the wind. I was also thinking on my way back tonight how the crew should practice sitting for about 12-15 hours to warm up for our Valentine’s Run. Lastly, a BIG HAPPY BIRTHDAY to my youngest grandchild Nicole who turned 6 years old today! Well, I am going to try and get caught up on my sleep. See you tomorrow. ♦ Travel: Ironwood-MI, Trail 2 to 8, Bergland, Trail 8 to Bruce Crossing, Trail 3 to Rockland, Hancock, Trail 17 to Calumet, Trail 3 to Coppor Harbor, Trail 135 to the point, Trail 135 back down to 3, Dollar Bay, Hancock, Twin Lakes, Mass City, Rockland, Trail 13 to Bergland, Trail 8 to Wakefield, Trail 2 to Ironwood. 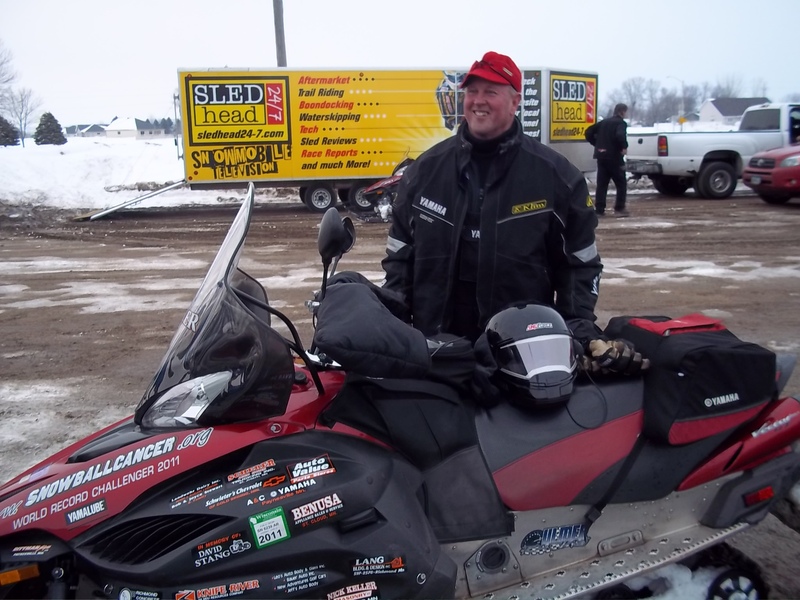 ♦ Notes: I finished up greasing the sled before heading out in the morning for a great day of riding with Nelle, Doc, Paul, Brian, and Todd. We had great trails all day. Nelle sure enjoyed herself andlikedthe lights coming into Hancock in the night. A big THANK YOU to Marcy for buying my first tank; Todd for my second tank; Brian for my third tank; and lastly Jerrod/Sarah/Josh for my last tank of gas for the day. I met a really nice lady at the supper club in Copper Harbor who signed by log book and then we talked about the foundation. She was really interested and was going to hang one of my Yamaha posters up there. That was really nice of her. On my way back tonight, I was thinking about the best routes for putting on miles andthinkingabout how Nancy’s husbandshould give her a wheelbarrow to push around more to build up stregth. Also, I was reflecting on January coming to a close andcoming into my last month of the run. I wonder if anyone will hire me since I am going to be out of a job within 23 days? ♦ Travel: Ironwood-MI, Trail 2 to 8, Bergland, Trail 102 North to 11, Silver City, Trail 1 South to Bergland, Trail 8 to Sidnaw, Trail 12 to Rousseau, Mass City, Trail 13 to Bergland, Lake Gogebic, Trail 8 to 2, Ironwood. ♦ Notes: I said my good byes to my family andfriends that were up for the weekend after taking a bunch of pictures by the sled outside and then got working for the day. I really appreciated them being here andgetting to sled with some of them as well. Hopefully, they will come back up and visit another time. Today I had Brian and Paul, and new arrivals Nelle andDoc ride with. Also, a big THANK YOU to Jerrod & Sarah Reese and Josh Kern for buying my first tank; Brian and Marg Willemsonfor buying my second tank; and Paul Larson for buying my third tank of gas for the day. I also greatly appreciate all of the people who have donated andwho continue to donate to the foundation during my cancer run. Also, to all of the people who gave/give money to help sponsor (maintenance/gas for the sled) during the challenge. When I was at a rest stop in Rousseau I was lucky to meet Tom J. from Cortland, Illinois. His wife is a breast cancer survivor and knows all about the struggles that come withcancer. He thought it was great that a group of people would start up a foundation that helps people with cancer. We talked for awhile and then I got his number so that hopefully we can go sledding together sometime. Otherwise, I will continue to practice for my 500 mile Valentine’s Day honor run. Hopefully, the other riders are jumping some rope andriding their sleds around the yards for their warm up. Well, I am going to have to head out and change my oil on the sled since it has been 7 days andmore than 2500 miles. Oh, last thing for the night…..I foundout when I got back that my aunt Toots (my mother’s sister) was caught red handed by her husband (uncle Jerry) accidentally taking my trail map that I keep on the table and having it in her purse. He told her ‘That is Nick’s map! You can’t take that.’ Good thing he caught her or I might be a little lost doing my blog each night andnot seeing the trail numbers that I took for the day. She doesn’t need to see on a map where I am each day; her only job is to keep praying for me. But since she liked the map so much I will send her one for Christmas next year. This way she can study it and be ready to come up and join me for a ride. ♦ Travel: Ironwood-MI, Trail 2 to Bessemer, Trail 11 North to 102, back down to Lake Gogebic, Bergland, Trail 8 to 1, White Pine, Trail 12 to 101, Trail 13 to Rockland, 40 mils loop to Twin Lakes, Trail 13 South, Greenland, Mass City, Trail 12 (20 miles), turned around to Trail 12, Trail 3 to Rockland, Bruce Crossing, Trail 8 Wakefield, Trail 2 to Ironwood, 12 miles to finish out on Thunder Rider Trails. ♦ Notes: I had to patiently wait for the young boys to get up and get their aching bodies moving this morning. I told Sarah (Jerrod’s wife) that the boys need to stay an extra week so I could get them whipped into shape. Those two boys have really been enjoying themselves and were playing in the snow like a bunch of kids today. They are having fun in the forest and rocky terrain, versus sledding on flat land back at home. So I opened a bag of deer meat up while on the trails; Jerrod and Josh devoured the meat and left me with almost nothing. So I figured I better get them some food and quick. Oh, my uncle Jerry came out to help me grease the sled in the morning. A THANK YOU out to Paul Larson for buying a tank of gas today as well. I am going to cut things a bit shorter and try and catch up on some sleep tonight. I am just staying up talking with all of the family and friends that it has been hard getting all of my sleep that I need. ♦ Travel: Ironwood-MI, Trail 2 to Bessemer, Trail 11 Northto Silver City, Trail 1 to White Pine, Trail 12 to Greenland, Trail 3 to Bill Nicholls trail, Hancock, Trail 17 to Calumet, Trail 3 to Copper Harbor, Brockway Mountain, Trail 135 loop to 134, Trail 3 back down to Calumet, Trail 17 to Hancock, Trail 3 to Mass City, Trail 13 to Bergland, 4 miles on Lake Gogebic, Trail 8 to Wakefield, Trail 2 to Ironwood. ♦ Notes: It snowed pretty good up here, about 8 plus inches. Which is great since I was almost going to give my uncle Jerry andaunt Toots $20 each to start praying (they got lucky again). I got a whole bunch of family and friends that came up to Ironwood for the weekendto snowmobile, visit, and show their support. Before heading out for the day I had 2 radio interviews in the morning. I also spoke withJim; he couldn’t ride with today since he had to get heading home. He really enjoyed andappreciated being able to ride with yesterday and will try andcome back to ride another time. So joining me for the day were 3 newbie students Jerrod Reese (my niece’s husband), his cousin Josh, and my friend Paul Larson. They did pretty good for all those miles. Also, Jerrod finally got the chance to fullfilone of his wedding vows – to snowmobile with me. He really enjoyed completing his wish. However, I think tomorrow we will have to pack them a paper bag lunch since we had to stop for about 30 minutes to let them eat some food (the boys were getting hungry). I have learned that stopping to eat just wastes time and loses miles that could have been achieved! 🙂 Jerrod says, ‘you are everywhere up here’ since he kept seeing my Yamaha posters at all of the stops along the way today. I also got a thank you from someone at a stop for starting up the foundation (that was really nice to hear). I also enjoyed watching people scratch their heads when looking at the miles on the sled and telling them that was all done in 103 days. They were just simply amazed and I enjoy the fact that the sled is running great. Lastly, a big THANK YOU to Marcy at the Hurley Citgo for buying my 1st tank of gas and to my brother Walt and wonderful wife Margee for buying the rest of the gas for the day! I truly appreciate all of the support and encouragement that I receive from everyone. ♦ Travel: Ironwood-MI, Trail 2 to 11 North, Trail 1 to White Pine, Trail 12 to 102, Trail 13 to Greenland, Trail 3 to Bill Nicholls trail, Calumet, Trail 17 South to Hancock, Trail 3 to Twin Lakes, Trail 13 to 40 mile loop, Trail 13 to Bergland, Trail 1 North to White Pine, Trail 1 South to Bergland, Trail 8 to 2, back to Ironwood. ♦ Notes: Today started out with a very grey and gloomy sky andthen turned nice with some snow by later in the afternoon. That was after riding in the mist for about 2 hours. Before heading out for the day, 2 couples from Granite Falls, MN came over to the house to see me and make a donation to the foundation. They have been following my journey since last year. So that was wonderful and we got to talk andtake some pictures with the sled. 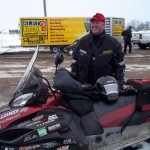 Then after that, I got the chance to have Jim Seaquestfrom St. Paul, MN snowmobile with for the day. He had been following me on the website anddecided that he was up for the challenge to ride with me and see a glimpse into how I live my life for 60 straight days. He came to ride for and show his support for the foundation and everything that it stands for. He enjoyed seeing all of the different people that I meet on the trails and at rest stops. Also, to see how people are interested in the snowmobile, my clothing, the foundation, and everything that my cancer run stands for. I really enjoyed his company andlook forward to seeing him again. We even ran into some people that I met last year on the trails from Illinois. A big THANK YOU to Pat’s Yamaha in Greenland for buying a tank of gas for me today as well. Lastly, one of the most amazing things that happened to me today was from a random person giving me a call this morning to donate $1,000 towards the foundation. They have been watching the website and cared about what the foundation stands for ‘People helping People’ directly and wanted to help. That truly was so amazing and I can’t tell you how much I appreciate your help during my fundraising efforts. Now that the foundation is up and running we just need to keep donations coming to help keep it going. People Helping People! ♦ Travel: Ironwood-MI, Trail 2 to Wakefield, Trail 13 to 3, Trail 17 to 3, Trail 134 loop up to Coppor Harbor point, Trail 3 to 17, Trail 3 to 13, finally Trail 2 back into Ironwood. ♦ Notes: Wayne checked over Mary Jane this morning and determined that she needed new slides (after only 5000 miles) and new wear rods. I also put new high fax on her as well. During the process we had a man go down in the shop. Todd got a blood blister from hitting is finger verses the object. The hammer got the best of him – I think next time you need to either use a bigger hammer or maybe your fingers are just too big. So he decided to stay back and keep his hand on something cold today; I am pretty sure it did not involve ice. I am not sure what he was complaining about since I didn’t feel anything. A big THANK YOU to Marcy at Hurley Citgo for buying my 1st tank of gas this morning and then to Deb at Krupp’s Mini Mart in Twin Lakes for the 2ndtank of gas for the afternoon. As we were out, Wayne had to turn aroundhalf way during the day since he was having difficulties with his sled. Then he had to call Todd’s towing service to come pick him up near Twin Lakes. He is currently working on the machine and hopefully back up and running for tomorrow. ♦ Travel: Ironwood-MI, Trail 17 South to Minocqua, Tomahawk Lake, Trial 370 to 270, Trail 15 South to 70 East, Sugar Camp Lake (in the middle of no where, according to the lady at the gas station), Trail 17 to Eagle River, Ran through lake trails, Trail 13 North, Land O’ Lakes, Corridor 6 to Presque Isle, Trail 6 to ManitowishWaters, Corridor 8 to Mercer, Trail 17 Northto Iron County Trails, Looped around on Trail 13-8-15 to get more miles, then back to Ironwood. ♦ Notes: Let me start off by THANKING Marcy (sorry for spelling it wrong earlier) at the Hurley Citgo for buying a tank of gas this morning. She said that she loves that people come in andcheck out my Yamaha poster that she has hanging up. It astonishes me everyday how other businesses have contacted me for my Yamaha poster. I find it so wonderful that they show their support for the foundation andeverything that it stands for. Thank you for your continued support! Well, I had a great day of riding with Wayne D and Todd M on the great Wisconsin trails. It was nice to adventure out and see new places. Even at one point we had to pull out a map to check where we were at. We were not lost since we still had gas in our tanks, just wanted to confirm our location. We were pretty far down into farm country. Wayne thought it was funny so he took a picture of Todd and I looking at the map andpointing to the trails. (I will have to post that picture later.) But like I said, we were not lost just sight seeing. The lady at the gas station said we were in the middle of no where. Otherwise, we ran into a lot of really friendly people at the rest stops along the way. I even spoke with a man who has a tree trimming business near Presque Isle whose father had prostate cancer many years ago, mother died of lung cancer, and a niece died from leukemia. It is so odd how one persons family can be hit so hard from this horrible disease and how these stories just repeat themselves over and over again from so many different people. ♦ Travel: Ironwood-MI, Trail 2 to Wakefield, Marenisco, Watersmeet, Iron River, Loretto, turned around and headed back northon Trail 2 back to Ironwood, then tookTrail 17 into WI down to Mercer, turned around back to Ironwood. ♦ Notes: I woke up very excited to be riding Mary Jane for her 100th Birthday today! So she has averaged out to 317.08 miles per day. Before taking off for the day I had to change the chain case oil and do a complete grease job on her. But as I was riding down the trails, I reflected on my grandchildren and trying to image Sean (down under) preparing himself for the cold by going in the freezers at the grocery store to prep for the cold weather. I am very thankful for all of the support that I receive from everyone. I really enjoy reading emails and getting the text messages of support on my phone. (I may not know how to actually text on the phone yet but I do know how to read them.) 😉 Thank you Anne and Winston for your message. Also, it always makes me smile and chuckle a bit thinking of my good Aussie-Italian friend whom I met last year. He and I enjoyed many laughs together on the boat. Well, everywhere I went today I got to hear more stories from people and how they have been effected by cancer. I was also able to hang up posters at the fill up stations and even a lady at one of them told a local man that I get to ‘tootal’ around all day (which I thought was a much nicer way to put it than Todd saying I just sit around all day) and that it is very neat that we have started up the foundation. I truly enjoyed my day and the trails were pretty good as well. Well, I am going to make things a bit shorter today since Wayne and Todd are in town to do some snowmobiling with me for the next week and we are going to have dinner up town to celebrate Trish’s Birthday (she works at a restaurant uptown in Ironwood). Oh, yeah. I also found out today that Scott will no longer be able to join me on my 500 mile day on Valentines Day due to work issues. Sorry to hear that. ♦ Travel: Ironwood-MI, Trail 2 to Wakefield, Trail 11 to Silver City, Trail 1 to White Pine, Trail 12 to Greenland, Bill NichollsTrail, Trail 3 to CopporHarbor, Trail 135 to 134, Trail 3 to Hancock, Greenland, Trail 13 to Rockland, Bergland, Trail 8 to Wakefield, Trail 2 to Ironwood. ♦ Notes: I headed out this morning with the sky so clear andthe sun shining so bright. My eyes enjoyed the beauty of the white forest trees heading up to Silver City on Trail 11 (it was just so pretty). When I got out in the open the wind was pushing my body, but never penetrating through the suit. It was very enjoyable out there today. When I got up to the top of Brockway Mountain there was a group of 4 men from Ontario, Canada. They were just reading about me in Twin Lakes from the poster hanging up and then the next thing they knew – I was standing next to them. They were very excited to see me and get to talk. Two of the men were known as Mr. Canada since they had snowmobiled across the country a few years back and for raising money. They told me their names, but heck how was I going to remember 4 french names. 🙂 So he told me that I could just call him, Le’Cat. That was much easier to remember, I told them. They told me that what they did doesn’t even light a candle next to what I am doing. One of them stated that he humbled himself before me…to meet 1 of the greatest. They sure made me smile andmade my day. Then, a big THANK YOU to Pat’s Yamaha in Greenland for filling my tank withgasthisafternoon. So with that, I went from a high on Brockwaymountain to having a man at the gas station in Hancock pour his soul out to me. As I was going to pay for my gas, a man standing near by told me that his sister has cancer, his ex-wife andgirlfriend both died of cancer, andhe just lost his best friend to cancer yesterday. This man truly knows all of the pain of cancer. As he spoke to me everyone in line stayed quiet, no one said a word. It was truly an emotional experience listening to this man talk. I could feel his pain. With that I rode on for the remainder of my day reflecting on all of the people that I meet on my day to day journeys. Also, looking forward for tomorrow celebrating Mary Jane’s 100th day of snowmobiling! Well, I am going to head out for the night since I have to quickly go change the oil on the sled since I have already put on more than 2700 miles in the last 7 days. Good Night. ♦ Travel: Ironwood-MI, Trail 2 to Wakefield, Trail 8 to 102, Trail 11 to Silver City, Trail 1 to Bergland, Trail 8 to Bruce Crossing, Trail 3 to Rockland, Trail 13 to Greenland, 40 mile Loop to Twin Lakes, Trail 120 to 121, Trail 3 to Hancock, Dollar Bay, Trail 3 to Mass City, Trail 12 to Rousseau, Sidnaw, Trail 8 to Wakefield, Trail 2 to Ironwood. ♦ Notes: I woke up this morning a bit tired since I only went to bed a little after 1am. I had to work on Mary Jane since she was a bit loud coming back in last night. I founda broken exhaust pipe andfixed it. I also check my oil faithfully but good thing she doesn’t drink any -she is always full. As I was sitting around on the sled today I came up withsomemore tips for the other riders. Nancy should carry 4 buckets of feed at a time like my niece did to get her endurance up for running. Jack should park his fork lift anduse a dolly cart instead. (Lookat all the fuel you will save.) Ron can push trailers around all day. Scott can put his power tools away and use a hammer andhandsaw. Mike can carry a little more granite around. (I also have to come up withsome tips for Tony.) I will also be keeping an eye on all of the trails to map out the best route for us to take on Valentines Day for our 500+ ride. Hopefully, we can keep gather pledges for how many miles we can really achieve on this date to honor our loved one’s who have passed away from cancer. I met many people on the trails today admiring my Yamaha Klimclothingand liking how well the 2010 RS Vector GT stands up to all of these miles. They are quite impressed. They also ask me why I am doing this cancer run challenge. I simply show them my book with all of my family pictures andthey completely understand why. I also explain how they may see me on the trails riding each day, but that it is a complete team effort to pull this off. I have the backing of A&C Yamaha Dealer (whom I speak to more than my own wife -some may say that I have my priority straight ;-)), Pat’s Yamaha Dealer, andYamaha Corporation. Also, my wife anddaughters doing all of the background work each day. I truly could not do it without their help. Thank you for your support! So if everyone can donate a little -we can keep growing as a foundation and reaching out to more people in need. Lastly, I did get the chance to stop in and see Claudia and wish her well. Well, I am going to try and get more sleep tonight and get up and hopefully ride another 400 mile day tomorrow. ♦ Travel: Ironwood-MI, Trail 17 South, Trail 12 West, Turtle Flowage, Ran across water about 20 miles, Trail 21 to 51, Manitowish Waters, Ran across another lake, Trail 2 to Winchester, Trail 11 North into MI, Trail 2 North to Wakefield, Trail 2 SouthtoSpread Eagle-WI, turned around and headed back to Ironwood-MI on Trail 2. ♦ Notes: I got up this morning anddid my daily radio interview. I spoke with Bill from KWLM-Willmar, MN. He has put out a challenge to all of the surounding Willmararea to get involved and pledge towards my 500 mile day on Valentines Day to honor my mother andothers who have passed away from cancer. Well, I put all of my layers on today since it was bitterly cold out this morning. It is overwhelming how the Yamaha Klimclothingholds up to the extreme weather. I have stayed perfectly warm each day compared to last year. It compliments the RS Vector GT sled perfectly. People are so impressed each day by the appearance andhow the sled stands up to the mileage that I put on it. People will comment how it is such a nice new sled. I of course tell them ‘New? It has over 30,000 miles on it already in the last year’. Then of course, I have to turn the key on the sled to prove to them. They get quite shocked to see those miles on such a great sled. Even an elderly man at a gas station today said that he never thought he would ever see a sled with those kind of miles on it. During my travelling today I was able to stop in at a few places and hang posters and talk to people (Gate Way near top of Turtle Flowage -my daughter Julie and husband Jason are at on a snowmobiling trip; Pea Patch in Manitowish Waters; Bingos in Wakefield). When I was at Bingosthe owner was talking to me about how his wife and daughter both got breast cancer. He said it was hard having to watch his daughter go through the treatment andthen turn around and talk withher own patients going through the same thing since she is a doctor in Rochester, MN. Very touching stories that I will keep withme. Also, I ran across a couple that I met last year at Lake Gogebic who signed my log book when I was out of the trails today as well. Lastly, I foundout today that I will be having another person join me on Valentines Day for my attempt to ride 500+ miles. Nancy Lynn is going to take on the challenge with me anda couple others. I will have to start giving out some endurance tips for my fellow riders that will be joining me on that day. So tip #1 for Nancy is for her husband Pat to take out the motor on the motorized feed cart and make her push it along. This will also save Pat on the wear of the wheels since he says that she spins the wheels driving it so fast. This will also keep her in the barn longer andgetmore quality time together. But like Todd says, ‘I don’t do anything each day -I just sit around on my sled’ so I will keep thinking up more tips and riding around in my circles to get myself prepped for the day. ♦ Travel: Ironwood-MI, over to Iron County-WI, zig zag all day and played in ‘my backyard’, then back up to Ironwood. ♦ Notes: I looked out this morning and saw that I didn’t need any sun tan lotion; it was so cold, frigid, and the wind howling. It looked like a ground blizzard but the sky was so clear. When heading out for the days ride, I decided that I was going to play in the backyard of Iron County-WI. Herb T introduced me to this area in the early ’80s and I have loved it ever since. I was very excited to roll the odometer to 30,000 miles in front of Camp ‘1’ doors at 4:42pm. Also, THANK YOU to Dale & Cathy of Camp ‘1’ for buying a tank of gas today. Otherwise, I spoke with a lot of people at the different pit stops along the way. Many people asking how they too can help support the foundation (P.O. Box 164, Richmond, MN 56368). It always makes me smile when people help support the foundation for all of the hard work that I am doing to raise funds for us to complete more projects within the communities. I am also wondering who is all following the blog. If you can email which state or country you are watching from is greatly appreciated. I am curious to see if we have the same amount of locations as last year or if we have grown a little more. ♦ Travel: Ironwood-MI, Trail 2 Bessemer, Trail 8 to 102, Silver City, Trail 1 to White Pine, Trail 12 to Greenland, Trail 13 to Twin Lakes, Trail 3 to 120, circled to Trail 121 and back to Trail 3, Mass City, Rockland, Trail 13 to Bergland, Trail 1 to White Pine, turned around, Bergland, Trail 8 to Wakefield, Trail 2 to Ironwood, headed over to WI on Trial 17, Mercer, andturned around and headed back up to Ironwood. ♦ Notes: I got up this morning and did a radio interview for a station in Litchfield, MN. I got to speak withasnowmobiling/hunting buddy Bob on the phone. He was telling me all about the local snowmobiling runs. How I do miss all of that local snowmobiling with Bob andHerb. Hopefully, there will still be snow on the ground for us to go out on the local trails in MN when I am all done at the end of February. I also hear that Donny Dingmann has been doing some snowmobiling. I bet if he keeps up the training and lifted some 2×4 that maybe he will be in shape to join me on my attempt for 500+ miles on February 14th. His wife, Mary Ann may even pledge a few dollars if he could pull that off. 🙂 I was also thinking a lot about my grandkidstoday (Zachary, Olivia, Tyler, Sean, Alex, and Nicole) and all the birthday parties I am missing withthemorjust spending some time with them. A big THANK YOU to Marci at the Hurley Citgofor buying my first tank of gas today as well as yesterday (I forgot to mention)! Well, when I stopped at Pat’s Yamaha in Greenland I had them tighten the cable slack and put throttle bushings in for me. That was very helpful – Thank you. Other than that, I just thought about how odd it is that numbers all seem to be lining up this year. I realized that on my 100th day of riding this snowmobile will also be my 30th day of this run which is the half way point for Snowball Cancer Challenge 2011. Lastly, I was thinking about how after tomorrow I will have over 30,000 miles on the odometer of my sled. A man that I met about 25 days ago told me that he would be impressed if the odometer would ever reach that point – so now I have proved that it can be done and hope that it puts a smile on his face that I made it there. ♦ Travel: Ironwood-MI, Trail 2 all the way down to Iron Mountain, turned around and headed back up to Ironwood, then headed into White Thunder Rider Trails, took Trail 17 to 15, then Trail 13 back to 17, back to Ironwood. ♦ Notes: I woke up this morning and did a radio interview and finished up on some paperwork. Then headed out to the garage to re-rivet the exhaust bracket (image that it only had 29,000 miles on it). 🙂 At a few stops today, I had people checking out the sled and my pictures in my book. I also had a few people call me the ‘Cancer Man’ or the ‘Mileage Man’ – I guess those are not too bad of names to be called since others call me ‘Crazy’. They say I am crazy but doing it for all the right reasons. Otherwise overall it was a very quiet day on the trails. I was able to enjoy the quietness of the sled (this is definitely the greatest sled that I have ever owned). I was able to ride in peace and be in deep thoughts all day. I will elaborate more on these personally deep thoughts after the ride is over. It basically entails why I consider February 23rd, 2011 my 10th birthday which also happens to be ‘Nick Keller Day’ in Richmond, MN. I didn’t even realize until I spoke with my daughter this evening that it was the very same day – a bit shockingly odd and coincidental that it is the exact same date. Well, I am going to try and get to sleep earlier this evening and hopefully get up early and out on the trails. ♦ Travel: Ironwood-MI, Trail 8 to Wakefield, Bruce Crossing, Trail 3 to Rockland, Trail 13 to Greenland, Trail 3 to Hancock, Trail 17 to Calumet, Trail 3 to Copper Harbor (Point at Stop Sign), turned around andfollow trail all the way back to Ironwood, then Trail 17 into WI, down to Mercer, andturned around back to Ironwood. ♦ Notes: I woke up this morning and did a couple of radio interviews and phone calls. Then headed out and finished up on the oil change from last night, put new primer clutch, and did some other random maintenance on the sled. I finally headed out for my 12 hour snowmobiling day up to Copper Harbor. I wanted to make it back up to get a nice picture for my daughter since last time I made it up there it was dark and the picture really didn’t turn out so good. When I headed out of town, Marci at Citgo in Hurley filled up my gas tank andthen Deb at KruppsMini Mart in Twin Lakes filled up my second tank. THANK YOU so much for the gas for the day, I truly appreciate it! I snowmobiled past these two guys a couple of times on the trails today and then they finally stopped me. They had been thinking so hard that steam was coming out of their helmets. They just had to know how many miles per day I had averaged out last year on my run. They had calculated on the trails that it was about 317 miles; I told them that they were very close. I actually averaged out 325.1 miles last year andthat I am aiming for 341.5 this year. I also met someone from Indiana on the trails that told me that my Yamaha poster was hanging up at his local Yamaha dealer back at home. I thought that was very neat. So that got me wondering which other states or locations is that poster hanging up at or where everyone is at that is watching me this year. I always find it interesting who is all following my journey. Otherwise, I think I am going to try and get some sleep for the night and do some more maintenance on the sled in the morning and hopefully get some more good miles on tomorrow. ♦ Travel: Ironwood-MI, Trail 2 to Bessemer, Trail 11 North, Trail 1 to WhitePine, Trail 12 to Greenland, Trail 3 to Calumet, Trail 17 to Hancock, Trail 3 to Twin Lakes, Trail 13 (40 mile loop), then down to Bergland, Trail 1 to White Pine, turned around to Bergland, Trail 102 Northto 11, Silver City, turned around to Trail 11, Bessemer, Trail 2 to Ironwood. ♦ Notes: I got some good sleep last night andeven slept in an extra 30 minutes than normal. I got the chance to make it up to Greenland andspeak withmy good friendPat (Claudia’s husband). Also, met some great people at my gas fill ups and eating stops. I even ran into a great guy named Denis Sobezak whose father passed away 4 years ago from lung cancer. I was happy that he could join me during the 40 mile loop. I told him to lead us down the trails so that I would have something else to look at for awhile. I enjoyed his company and our great conversations along the way. I look forward to him joining me again hopefully next week. Otherwise, I thought a lot about my grandkids and everything that I am missing not being at home. However, I know that God puts me in front of people each day that I am meant to meet. So for that I am thankful. I also thought about Cole when I was riding in for the night. The full moon was so beautiful out this evening and I enjoy watching it. (I always think about him when I see that full moon and know that he is watching from above.) So I have to say this was a very rewarding day; I got to meet a lot of wonderful people and even got handed some donations along the way. ♦ Travel: Ironwood-MI, Trail 2 to Bessemer, Watersmeet, Trail 107 to Kenton, Trail 8 to 15, Sidnaw, Trail 12 to Rousseau, Mass City, Bill Nicols Trail on Trail 3, Trail 13 (40 mile loop), Mass City, Trail 3 to Bruce Crossing, Trail 8 to Wakefield, Trail 2 to Ironwood, Trail 17 South to WI, Trail 15 (about 15 mile loop) and back to Ironwood. ♦ Notes: It was a wonderfully, cold, snowy, damp day. The snow was coming down pretty good this morning and on/off all day. I got to wish my grandson, Tyler a very Happy 8th Birthday this morning. He told me to go out and ride a lot of miles for him. So then Paul Weinmann, Patrick Budgett, andI headed out for a great day of riding. There was a lot of people out on the trails so we tried to findareas with as minimal people as we could to stay out of the traffic. A big THANK YOU to Paul for buying 2 fill ups and Patrick for 1 fill up at the gas stations. Hopefully, the boys were not too disappointed that I was tired and didn’t put more miles on for the day. I had only gotten minimal sleep last night (maybe 5 hours of OK sleep) so I was pretty tired and was started to get a gut ache by the end. So I think that I am going to cut it short for the night and get caught up on some sleep. ♦ Travel: Greenland-MI, Trail 3 to Houghton, Trail 17 to 3, rode to the very tip of Copper Harbor point (turned around at the stop sign at the water shore), Trail 134 to 3, Trail 17 to Hancock, Dollar Bay, Trail 3 to Bruce Crossing, Trail 8 to Wakefield, Trail 2 to Ironwood, Trail 17 SouthtoWI, Trail 15 (about 15 miles down), turned around and back to Ironwood. ♦ Notes: Started the day by Paul Weinmann andPatrick Budgettdrivingme up to Greenlandwhere I left the sled for the night. Thank you so much for taking time out of your snowmobiling vacation to haul me up. They are going to meet up with me on Saturday morning anddo some sledding. The mechanic found the water leak and quickly repaired it (rest assured that I didn’t need depends for MaryJane), but since we already had her in the shop they graciously helped me do some other maintenance work that I would have had to do during the week. THANK YOU SO MUCH! This will definitely save me some extra time in the week to get more riding in and less having to work on the sled alone. As I was waiting for the sled I got to meet a lot of nice people at the Yamaha dealer and at the cafe down the street. I actually even walked myself down about 4 blocks. It was kind of nice walking for a change and standing as I ate to stretch my body out. As I told a new friend that I met today…Everyday I get introduced to or meet someone that has cancer or someone whose family member has just died from cancer. And each dayIlistentotheir stories andare touched. The cafe in Greenlandeven asked me what they could do to help promote the foundation and help with our cause. So they will be happy to sell our Snowball Cancer Challenge t-shirts at their location (only $15). If your business would also be interested in helping out the foundation, please email us. If a few more people can help us out, the more we can help others. People helping people like I always say. Otherwise, I did alot of thinking on the trails about all the people fighting against cancer (including my sister Carol). Like I said, I meet a lot of new people out snowmobiling and I never forget about their stories. Other than that, I have to try to stay focused on the trails and especially the stop signs. You only die 1 time so you have to stop at all the signs and don’t slip on the trails. So when it hit 12:30am, I called it quits for the night and got to bed. ♦ Travel: Ironwood-MI, Trail 2 to Wakefield, Trail 8 to Bruce Crossing, Trail 3 to Brockway Mountain, Turned Around, Trail 134 to Trail 3, then Houghton. ♦ Notes: As you can see my snowmobiling stopped near Houghton this evening. There was some really great people that helped me on the trails today. Then, the Hancock Yamaha dealer got my sled andI all the way down to Greenlandat Pat’s Yamaha (to his brothers shop) where it is now sitting for the night waiting for the mechanic in the morning to fix the water leak. THANK YOU everyone who helped me out today! Also, for my great neighbor in Ironwood who drove all the way up to Greenlandto pick me up so I could get myself back to the house to rest for the night. Otherwise, my day was going pretty well. I met lots of great people like always. Especially at my gas stop in Twin Lakes where I there were around a dozen people talking to me. Then when I got to the top of BrockwayMountain, there was no one there to help me take my pictures. But then suddenly a group of sleds turned themselves around since they recognized me and help take my pictures. People are truly great up here. Lastly as I was riding today, I was thinking about the Schultz family from Grove City, MN that I met at the Yamaha photo shoot earlier this week. Scott and Norma have 4 little girls (Britney 10, twins Karla and Kari 8, and Booke 4) who follow me on my journey and love Yamaha. So ‘hello’ to you. I am going to get some rest and see what tomorrow brings me. I hope to get out and catch up on my miles. ♦ Travel: Ironwood-MI, Trail 17 to 15A, Trail 15 to 11, Trail 9A to Camp ‘1’, up Trail 9 to 11, Trail 13C to 13, Trail 8 West to 77, then Hurley. Then Trail 2 to Bessemer, Maarenisco, Trail 13 North, Trail 100, Lake Gogebic, Bergland, Trail 102 to 11, Silver City, Trail 11 to Bessemer, Trail 2 Ironwood, then finished up the miles with Trail 17 down for about 15 miles andturned around. ♦ Notes: I had a busy morning doing 2 radio interviews andgreased the suspension on the sled. We also had gotton another 12-16 incles of fresh snow overnight (andsnowed a little through out the day). I made stops to visit Dale & Cathy at Camp ‘1’, as well as stopping at Willie’s near Island Lake and then again at the Hoop N Hollar. It is great getting to meet with people and listen to their stories. One gentleman asked me, “what do you get after all this? '” I simply respond, ‘satifaction’. Also a big Thank You to Marci from Hurley Citgo for paying for a tank of gas. today. Otherwise, Mary Jane bucked a little today when we were on our way to Camp ‘1’. She was nervous about getting past the water hole that she fell into on the pre-run outing. I assured her that the water was all frozen over by now. 🙂 Lastly, new blood is suppose to be coming in the next day or two. We will see if they can show me were the throttle is. ♦ Travel: Ironwood-MI, Trail 2, Days Inn-Hurley, Trail 2 to Wakefield, Trail 102N to 11, Trail 1, White Pine, Trail 12 to Greenland, Trail 13 (40 mile loop), Trail 3 South, Mass City, Rockland, Trail 13 to Bergland, Trail 102N to 11, Bessemer, Trail 2 to Ironwood, then finished off my miles with Trail 17 and 15, then back to Ironwood. ♦ Notes: This was my second day having to set my alarm clock. I am definitely not going to miss it tomorrow. I got up and did a radio interview and then headed over to Days Inn and spoke with a bunch of people about the cancer run. Then, headed out into the woods to take photos with Yamaha. I had a great time and look forward to seeing what the pictures look like. After all of that was done, I headed back to the house and picked the Lynn’s and Todd up for our day of riding. A big THANK YOU to Nancy and Pat Lynn for paying for ALL of my gas for the day. I greatly appreciate it! We had a lot of fun riding in the falling snow and sometimes wind blowing 20-30 miles/hr. I just love riding in that kind of snowy and windy conditions. Also, the snowmobiling had to come to a complete stop so that I could visit with my great friend Claudia for about 1 1/2 hours during the middle of the day. It was my turn to give back the strength and courage to keep up the “positive thinking and to just keep moving”. Claudia was there for me when I was all alone last year dealing with my own daughters bout with Cancer and get me through all of my rough days. I truly respect her and for all that she has done for me. It is very rewarding for me to get to spend time with her and all other people battling cancer. It keeps me motivated and I hope all of you keep up the great support for the foundation and wanting to help people. Like I always say, “People helping People”. That is truly what it comes down to in life. ♦ Travel: Ironwood-MI, Trail 2 to 8, Trail 102 North to Trail 1, Silver City, White Pine, Trail 12, Ontonagon, Greenland, Trail 13 Bergland, Trail 1 to White Pine, Trail 12 over to 102, Trail 13, Mass City, Trail 12/8 East Rousseau, Sidnaw, Trail 8 to Kenton, Trail 102 down to Watersmeet, Trail 2 into Ironwood, then headed on Trail 17 to 8, over to Trail 15, and back up to Hurley/Ironwood. ♦ Notes: I had to set my alarm clock for the first time so that I could do my hair and get on over to Days Inn, Hurley to do an interview and filming withYamahathis morning. I had a great time meeting all of the different people that were there andshowing them the ‘like new’ sled withonly26,000 miles on it. After spending a couple of hours with them; they told me that I needed to get back to work. Or maybe they just thought my hair was getting too messy and needed me to come back tomorrow after I get time to re-comb it. 🙂 So I will have to set the alarm again in the morning to head back up. Well after all of that I still got a great day of riding in. A big Thank You to Brian and Margie Willemson with A-One Trucking for supplying a tank of gas. Mary Jane was whining a little bit in the morning about breaking in her new shoes until she got used to them; but then she started whining about wanting new fingernails. I will have to put them on in the morning before I head out. Otherwise, I have now decided to wear all layers of clothing and then if I get to warm then I will take a layer off. But each day I rotate the clothing so that I am putting all new fresh clothing on me to keep me warm, dry, andsmelling good. Lastly, I did most of my thinking today about my great friend Claudia (you may remember her from the Sledhead videos from last year). She is battling a courages fight against cancer. She is truly an inspiration to me and keeps me fighting strong. I am going to try and visit her soon since my cold has finally gone away. ♦ Travel: Ironwood-MI, Trail 2, Trail 8, Trail 13 to Greenland, 40 mile loop, Twin Lakes, Trail 3, Greenland, Trail 13 to Bergland, Trail 8 to 2, and back to Ironwood. ♦ Notes: Well, the family all took off this morning (it was great that they came and visited) and then Todd, Brian, and myself headed out for sledding. It was cold out this morning so I put all of my layers on. I was a little on the warm side, but the clothing wicks the moisture away from your body and you never feel sweaty. The clothing is a great investment to make and it works wonderfully. Otherwise, the trails are pretty much back to 100% compared to one week ago withthe rain and ice conditions. Withthat, the gas mileage is back down in normal range with all of the snow friction. I do mean alotofsnow(Twin Lakes area had about 2-3 feet of new snow and still coming down hard). Well, I knew today was going to be a short riding day since we had scheduled maintenance for this evening. Mary Jane is now back to 100% again after getting new high fax (didn’t do last night since I had a huge headache from being sick-feel much better today), fixed the bracket that has been vibrating for 26,000 miles, new donuts, and clutch spring (about 22,000 miles on the part). Now she is good as new andready to go for many more miles. Thank you mechanic Nick from Pleasant Prairie – Yamaha for coming over and helping with the maintenance! ♦ Travel: Ironwood-MI, Trail 2 down to Iron River, back up to Trail 107, Kenton, Trail 8, Sidnaw, Trail 109, Trail 12, Mass City, Trail 13 to Bergland, Trail 8 to Wakefield, Ironwood, and lastly an additional 10 miles down Trail 17 and back up. ♦ Notes: I was up pretty late last night doing maintenance on the sled andthen up again this morning to ride. Well, I sled down to Iron River andran out of snow (there is not much there so i had to turn around and head a different direction). Otherwise, I met more great people at my gas stops and pop break stop in Rousseau. My goal for today was just to get the miles on the sled andget back home so that I could visit with my brother and sisters that came up yesterday to show their support/vist me andget myself to bed at an earlier time. During the day, I was thinking about how much I do really miss my grandkids. I am hoping that there will still be a bunch of snow on the ground when I finish up in 46 days so that I can do some snowmobiling andice fishing with them this winter. Well, I am going to make it short again tonight since I have to go out and tear down the suspension and put new high fax (the set on it has close to 5,000 miles). ♦ Travel: Ironwood-MI, Trail 2 towards Wakefield, Marenisco, turned aroundat Trail 13, Trail 2, Trail 11S about 13 miles, Trail 11 north, Wakefield, Trail 8 to 102 to 11 west, Road 519, turned around Trail 11 east, Silver City, White Pine, Bergland, Trail 102 north, Trail 11 east Bessemer, Wakefield, Ironwood, and lastly an additional 5 miles down Trail 17 and back up. ♦ Notes: I woke up this morning feeling much better than yesterday so I knew it would be a great day at work. We had a nice snow storm all day withwind chill advisory and 30-40 mile an hour winds. There was even some spots that you couldn’t see 50 feet in front of you. There had to be about a foot of fresh snow in some areas. Others may complain; but I smile. Now this is what I call a perfect day! WhenI was on Trail 11 south near Marenisco, I also came across 2 teams of sled dogs. It was so beautiful. I just enjoy watching them andhearing how quiet they are when they pass you. Otherwise, I was able to visit withalldifferent people at my gas stops along with hanging up some more posters. A big THANK YOU to Marci at CitgoinHurleyfor buying my first tank of gas this morning. Well, I am going to make things short tonight since some of my siblings came up for visiting (John, Doris/Keith, and Alice/David). Also, I have to run out and change oil on the sled. ♦ Travel: Ironwood-MI, Trail 2 to Bessemer, Trail 8 to Wakefield, Trail 13 Rockland, Trail 3 to Toivola, then turned around on Trail 3 down to Twin Lakes, Bruce Crossing, Trail 8 to Bergland, Trail 1 to White Pine, took a couple of lapse, Trail 102 to 11 North, Silver City, turned about and headed back on Trail 11 to 102, Trail 8, Trail 2 back to Ironwood. ♦ Notes: I woke up this morning with a huge head cold and a pounding headache. There was about 2-3 inches of fresh snow in Ironwood andabout 8 inches past Berglandtoday. It is just a nice white layer on the ground but we definitely still need more snow. When I was riding, I was thinking about how each mile I go slowly accumlates and eventually will get me over the big mountain. I was actually pretty shocked coming in tonight and realizing that I completed the exact miles as yesterday (even though I completely took different trails). I want to give a THANK YOU to Krupp’s Mini Mart in Twin Lakes on the Bill NichollsTrail for paying for a tank of gas today. I really appreciate it. I also got the chance to meet Norb SchlichterfromAdams, MN that was at the gas station in Twin Lakes. He gave a donation to the foundation andalso rode with me from Twin Lakes back down to Berglandwhere he has a second home. It was great getting to meet you and please come join the cancer run at anytime. Also at a gas fill up today, I met a Professional Body Trainer from Illinois. He was talking about my poster and how many miles I had on the sled (as he slapped the poster) when I came up behind him and told him not to hurt me. He was very happy to meet me and see the sled. Well, I better hit the haystack for the night. I hope to feel better in the morning. ♦ Travel: Ironwood-MI, Trail 2 to Wakefield, Marenisco, 10 miles past andturned around, back up Trail 2 until Trail 11S, headed down for about 10 miles, turned back around, headed north on Trail 11, Wakefield, Trail 8 to Bergland, headed up Trail 102, did 2 lapse on Trail 11, Trail 102, Trail 1 to White Pine, then turned around and headed back to Ironwood. ♦ Notes: I knew it was going to be a great day when I looked out the window and saw SNOW! My uncle Jerry and aunt Toots are pretty lucky. I was getting a little desperate for snow that I was almost going to send them money to go to church and kneel on the cold concrete steps and start praying for their nephew. They dodged that bullet. Since they are a couple years older than me I would have let them use a towel on their knees; personally I would have gone withnothing and stayed on the cold bare steps. They may have been lucky this time but we still need much more snow coming my way. So please keep up the good wishes. Otherwise this morning I was able to speak withYamaha and they are coming to town this weekend (I hope to meet up withthem and speak withpeople and do some pictures), did a radio interview, and talked withafewfriends checking in. Todd was great as well today. He got up and made me breakfast, washed dishes, shopped for household items, hung tools in the garage, and PR work around town. He did it all with a smile on his face and no allowance. Thank you for your great help! Also, a big THANK you to Marcy at Citgoforfilling up my first tank of gas again today. I have to say that I was getting a laugh out of myself while riding. I was thinking back how 10 years ago it was such a big deal and accomplishment that I just made 400 miles in 1 day. Now withmygreat sled that I have; it is a walk in the park going over that many miles. I think that I am finally in shape for all the new meat to come up and challenge me to a 500 mile day. I will keep getting myself ready until you get here and along the way getting the chance to meet alotof great people. People are very friendly and I still get rewarded each day with acts of kindness. Well, since I had a nice relaxing easy day for miles; I am going to get some work done on the sled. I am going to pull the panels off and wash the clutches and grease the barrings on the jack & drive shafts (also, do my daily inspection of the suspension & high fax). Also, I will be having another oil change in a day or two. Lastly, I want to thank the groomer operators for their great job on the trails and your support of the cancer run. You truly understand why I am out here doing what I am doing. Thanks! ♦ Travel: Ironwood-MI, Trail 2 to Wakefield, Trail 8 to Bergland, Trail 102 and Trail 11 back and forth all day to get my miles, then back to Ironwood. ♦ Notes: Well, today was my 80th day of riding ‘Mary Jane’, my 10th day of SCC 2011, and my personal high mileage day of all time (last year I had 450 miles in one day). So I have to say it was a pretty good day 🙂 I need to give a Thank You to Marcy at Citgo in Hurley-WI for buying my first tank of gas for the day. Also, I remembered that I failed to mention that Ron from New Adventures bought gas on my first day as well. Thank you! It is just so amazing that I am still being able to get more than 20 miles/gal and the sled keeps running stronger each day. It is great to ride in pride knowing that you made a great investment. Well, it was another day of not seeing much out on the trails. I only saw 8 other snowmobilerswithinmy12 hours of sledding and only 1 fox. I just can’t wait for us to get more snow so that Mary Jane and I can start venturing out to see other places. Lastly, when I was on the sled in the cold temperatures I was thinking about my grandson in Australia. I was thinking about how he will be coming over next year for his first white Christmas. He will need to get use to the cold over here. Maybe you can stand in a walk in cooler in Australia to get prepared for the weather. I love to ride snowmobile, but I also can’t wait to just relax andenjoy spending time with my grandkids, wife, and kids. ♦ Travel: Ironwood-MI, Trail 2 to Wakefield, Trail 8 to Bergland, Trail 1 to Road 64, White Pine (3 lapse), Bergland, Trail 102 up to Trail 11 (2 lapse), Silver City, back to Trail 8, Trail 2, Ironwood. ♦ Notes: Did some maintenance on the sled this morning before heading out to the flat, hard, icy trails. I felt like a NASCAR driver doing all of my lapse and keeping an aggressive pace. Enjoyed a slushy drink while on the trails; not sure why my juice froze up on me? However, it was a bit lonely since I only saw 2 other riders on the trails. Also, I didn’t have time to think much since I had to do alot of concentrating on the icy paths in front of me. Otherwise, I did put my additional layer 3 on this afternoon (but it was very damp since it had been in my saddle bags for 9 days and 2 rain storms). I brought them in the house tonight to warm up and will put in a bag to help keep the moisture out for next time. Lastly as I was riding, I passed a news media van on the road. I kept wondering how many supporters do you think it would take to get a human interest story on the cancer run on tv? Well, I better get myself out of the hot tub that I have been sitting in while writing the blog tonight. Good night everyone. ♦ Travel: Ironwood-MI, Trail 2 to Wakefield, Trail 8 to Bergland, Bruce Crossing, Trail 3 to Rockland, Greenland, SouthRange, turned around and headed back, Rockland, Trail 13 to Bergland, Trail 1 to White Pine, came back around, Trail 102 to 11, Silver City, trunedaround back to Trail 11 south to Road 519, took Trail 11 north to 102, Trail 102 back down to Hoop N Hollar, Trail 8 to Trail 2, Ironwood. ♦ Notes: Changed carbides on sled this morning before heading out. The lady at the Bessemer gas station thought I was a bit crazy when I told her it was pretty nice out today. The weather is nice for riding but I definitely need snow and quick. So when you are all praying for me please ask for snow as well. I would greatly appreciate it. Otherwise, not much happened today – didn’t hardly see anyone out on the trails due to the lack of snow. George at Hoop N Hollar said there was only 1 guy on the trails today, me. I think I will make it quick/short tonight and get some rest. I hope to get a bunch of miles on tomorrow to hopefully raise up my average. ♦ Travel: Ironwood-MI, Trail 2 to Wakefield, Trail 8 to Bergland, Trail 102 to 11 up to Silver City, down to Road 519, turned aroundbackup to Silver City, turned around again and came down, Lake Gogebic, repeat previous route 2 more times, Porcupine Mountain, down to Trail 1 to White Pine, then turned around and headed back to Ironwood on Trail 8 and 2, then road Trail 17 for about 5 miles on the White Thunder Rider Trials. ♦ Notes: Greased machine again this morning since I have been going through so much water holes for the past couple days; however most areas are starting to freeze withthis cold temp that we had today. It was very cold and dreary out this morning but ended up being a very pleasant day outside only needing 2 underneathlayers. It felt like a very easy day of riding compared to the last 2 days fighting the rain and rough trails. The groomers are doing an excellent job fixing up the trails from all the rain. Otherwise, the sled seems to be running stronger as I put more andmore miles on it. With the cold weather, hard trails, andsensible driving I was averaging 21 miles/gal. As I was riding I was trying to see what I should average my speed at for the day….so I went around my age; not my IQ. Because of what I am doing, people think I am not so bright – they say I am a bit crazy. However, I feel more and more motivated to keep riding when I listen to peoples stories how they are being affected by cancer. So as I was riding my 25 mile loops over and over again today, I kept thinking about all the family members who are battling cancer. I keep riding for you. Lastly, I want to give a big THANK YOU to Hoop N Hollar for supplying part of my gas for the day as well as picking up the tab on my lunch. Also, thank you for sharing your personal story about a family member battling cancer. ♦ Travel: Ironwood-MI, Trail 2 to Wakefield, Trail 8 to Bergland, Trail 102 to 11 up to Silver City, Trail 11 south for 23 miles, Trail 102 south, Lake Gogebic, Trail 1 to Hwy 64, turned aroundback to Ironwood. Then when to the parade andvisted withpeople for 2 hours then sled in Wisconsin on Trail 17 until 8, west to Trail 15, down Trail 13, Trail 13C, turned around, back to Trail 13, Trail 15 to 8, Trail 17 back to Ironwood. ♦ Notes: Woke up this morning and used the Yamalube grease for under the suspension that was over due. It really needed it. After finally changing into a new set of Yamaha clothing this morning (which feels really good & comfortable) I headed out in the foggy, drizzly, icky conditions. I have to say that I am getting tired of sledding in the rain but just like people with cancer; they put a smile on their face, don’t complain, and keep going. So that is what I did too (smile and go). I met lots of interesting people at my stops and on the trails. They were so amazed at how many miles are on the sled in such a short amount of time. Also, that I have been getting between 17-19 miles/gal thus far. Lastly, I want to wish everyone a Happy New Year! And say ‘hello’ to all 6 grandkids, family, friends, sponsors, and all who have donated. I really appreciate your support and keep you in my thoughts. Good night to all of you staying up late. ♦ Travel: Ironwood-MI, Trail 2 to Bessemer, Wakefield, Trail 8 to Bergland, Trail 13 to Trail 101, Trail 12 (since they were rought), turned around and headed back on Trail 13 to Rockland, Trail 3 to Houghton/Hancock, back down Trail 3 to Mass City, Trail 12 to Rousseau, Trail 3 to Bruce Crossing, Trail 8 into Bergland, Trail 2 to Ironwood, then road for 20 miles in the ThunderRiderareain the dead zone with no signal. ♦ Notes: This morning I started out withasmileon my face knowing it was just ‘Mary Jane’ and myself and the forecast showing 80% chance of rain (I knew we would be getting wet today). I made a quick stop at Cary’s Mine in Hurley-WI to fill up on gas and was introduced to a very nice lady, Wendy W. She lost her daughter to cancer and was talking to me about her story. Then, when I was filling up at the gas station in Mass City, I got the chance to visit with MeriBrown (Rachel’s mom). Maybe you will remember me talking about Rachel from last year. I still keep in contact withthefamilyand like to catch up on her progress with the cancer as well. It was a great day getting to visit and meet more wonderful people. It truly motivates me to ride harder and longer to raise more funds for people battling cancer. Halfway through the day, I made it up to Houghtonatwhich point it started to rain. So I got myself back on the trails and headed back knowing I still had more than 100 miles to go. The suit held up very well in the rain withgreat water repellent protection. I never felt wet, which is wonderful. However, it did make me remember about the Richmond parade from this past July when we rode on a float withthesled in the down pouring rain. That was when my daughter Carrie, son-in-law Stuart, grandson Sean, along with Winston and Salomi were here from Australia. We had so much fun riding in the rain and letting the Australians enjoy their first parade. So that put a smile on my face as I was riding down the trails in the rain. 🙂 Otherwise, the trails are pretty soft and minimal snow coverage but overall very happy on how many miles I was able to still get. ♦ Travel: Ironwood-MI, Trail 2 to Bergland, Trail 1 to Silver City, Trail 11 back to Wakefield, Trail 2 down to Marenisco, Watersmeet, Iron River, up Trail 2 to Trail 107 to Kenton, Trail 8 back to Bergland, Wakefield, and Trail 2 to Ironwood. ♦ Notes: I finally got the oil leak figured out and fixed last night. Then, woke up this morning anddid a radio interview withKNSIout of St. Cloud, MN. I took off this morning with my bottom two layers on but quickly got to hot and stripped down on the trails to just layer 1 and my suit (layer 4). The trails are very deteriorated by the weather. We need the snow to come soon. After Mike and I headed out this morning, we picked Brian up at the Hoop N Hollar. I was very touched by an employees emotional hugs when I walked in (her sister was recently diagnosed with cancer). People have just been very supportive and have personally been affected by cancer in their lives and happy to see me when I stop. Beyond that it was a great day meeting people and having friendly faces greet me at the doors at many businesses along the way. I also got the questions from people on how I can do so many miles each day and wake up and do it again the next. I asked a group of young guys at one of the stops if they wanted to ride with and they just shook their heads and smiled. I guess they couldn’t keep up. Well, I am going to keep things short tonight and try and get some rest. We will have to see what the weather brings me tomorrow. ♦ Travel: Ironwood-MI, on Trail 8 to Bessemer, Wakefield, Lake Gogebic, Trail 1 to White Pine, Trail 12 to Trail 101, then Trail 13 to Rockland, Greenland, Trail 13 to Twin Lakes, made a big loop, then back to Trail 13 to Greenland, Bergland, Trail 8 to Wakefield, then finally Trail 2 to Ironwood. ♦ Notes: I had to work on the gasket sealer on the bolt head this morning before heading out for the day (oil leak). I stopped working on it since the parts that I will need to do a complete fix will not be arriving for another 2 days. So my work day was low on mileage but I figure I will make up the miles on another day. Mike and I headed out this morning and then picked Brian up on the way near Lake Gogebic. Brian only ran out of gas once today withhisnew machine, but we were able to meet a lot of really great people on the trails. People recognized me from last year and were happy to shake my handandsaid they would keep watching this year. I also got the chance to visit withClaudia (at Pat’s Yamaha Dealer in Greenland-you would recognize her from the Sleadhead24/7 video from last year). It was a very humbling experience being withherand getting to personally bring her a quilt to remember me by as she battles her cancer and goes through chemo. I know she put a hat on since she was so worried about her hair loss; unfortunately my hair was a bit messy as well -helmet hair. 🙂 Like so many cancer patients, she is always worried about others and never about herself. Never complaining about what they are going through…. Well, I am going to make things short for my blog tonight since I still need to go back out and check over the sled andsee if there is anything else that I can do to stop the oil leak so that I can try and get more miles on the sled tomorrow. Also, I am hoping to be on a float with my sled on Friday night in Hurley-WI/Ironwood-MI for the Winter Festival. Wish and pray hard for SNOW everyone, I could definitely use some. ♦ Travel: Ironwood-MI, on Trail 2 SouthtoWakefield, Iron River, Florence-WI, then turned around due to lack of snow so I headed up to Crystal Falls, turned around then back on Trail 2 to Iron River, up to Trail 15 to Sidnaw, Trail 18 to Kenton, Trail 107 South to Watersmeet, then back on Trail 2 to Ironwood, andlastly circled around a little on the ThunderRiders Trails in WI to up my miles for the day. ♦ Notes: I got a late start this morning since ‘Mary Jane’ had a small oil leak that needed to be sealled up. So I had to do some excessive riding to get my miles for today (It was plenty warm out with my layers). When riding, I was thinking how my daughter Carrie from down under is in Tasmania for a few days sightseeing and will not get an email telling me how my blog stinks. 😉 I am sure I will get a call when she gets back. Otherwise, I saw a lot of deer on the trails and we could definitely use some more snow. When, Mike and I were out riding we met a lot of really friendly people and many who recognized me from last year. Also, want to give a big THANKS to Artistic Stone, Inc (owners Mike & Sue Guggenberger) for supplying all the fuel for today’s cancer run. I will try to remember to mention those people/businesses that help support with fuel as well this year since I failed to remember to mention them each time it happened last year. Thank you to all that help and support. Lastly, thank you Todd, Bob, Clarence, and Ron for going out and doing PR work today (even though Todd was asking for an allowance but I told him that it wasn’t in my budget and he needed to wing it). ♦ Travel: Richmond-MN up to Farming, Albany, Soo Line Trail to Holdingford, Moose Lake, Superior-WI, Trail 2 to Ashland, Trail 13 South to Marengo, Mellon, Trail 77 to Iron Belt, and finally Ironwood-MI. ♦ Notes: I want to start out by thanking everyone for turning out this morning. It really makes a guy feel appreciated when my family, friends, and community stand behind me during my cancer fundraising efforts. Overall, the trails were pretty good except a little rough around Duluthfor about 20 miles. The scenery was so pretty out today with the high humidity levels and frost. The trees were all white and very bright. It only took my eyes a little bit to adjust to the brightness and then just took in the great sights along the way. I pulled over on the trail just east of Moose Lake to let a dogsled go past. Then, when I was thinking about Lawrence Dingmannand David Gertken (who are sadly missed); I saw 2 big bald eagles circling overhead. I just smiled and kept on riding. Otherwise, the guys that joined me during my ride today did a great job and enjoyed themselves. Thanks Bob, Ron, Mike, Donald Posch (fighting cancer), and George Hadrichfor riding with. I am glad that I got to be apart of fulfilling a wish for you Donald. Unfortunately, I couldn’t say the same about Todd since his heated shield malfunctioned today and had to turn around shortly after taking off this morning and trailer up instead. Hopefully, he gets it figured out and can ride tomorrow. 12.22.10 Nick has the sled in great working order. It has gone through all of the required maintenance for the upcoming sledding year. The engine and chassis are the original and have not been replaced. Nick will try and put a few more miles in before he officially starts his 60 day journey on December 26, 2010. Nick plans on leaving at 8am Sunday. 12.12.10 Nick is getting ready to do some pre-riding starting Monday, December 13 to get loosened up for the big run. Nick is going to head up to U.P. Michigan for approx a 3-4 day trip. The spot tracker should be up andrunning if you want to follow along with Nick on his adventure. Nick completed about 400 miles of test riding within 3 days and hanging up posters.